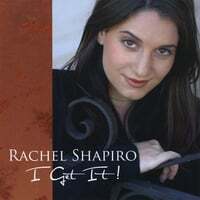 Rachel Shapiro's Debut CD "I Get It!"! You can now buy Rachel's CD on the iTunes Music Store! You can also help by writing reviews and by creating iMixes. You can now buy Rachel's CD at the Internet's favorite CD retailer, CD Baby! Check it out! Write a review! You can also buy Rachel's CD at Amazon. I Get It! is the full-length debut CD from actress and recording artist Rachel Shapiro. With a few well-chosen cover songs ranging back to the '60s, a batch of fun, clever pop gems written by her producer, and one very cool original song written by Rachel, this CD showcases a refreshing young artist with amazing range. The guitar and keyboard arrangements bring some big rock and roll hooks, some catchy pop, and plenty of smiles.